Countertop replacement – Why replace when you can refinish! Kitchen countertop replacement is a significant and expensive project that warrants consideration of all the options. Be sure to include all the actual costs as well as the hassle and mess of construction before you commit to a traditional removal and replacement makeover. Are you prepared to be without a kitchen for several days or even weeks? Invest the time to research the advantages and disadvantages of the various materials used to construct countertops…typically tile, granite, concrete, solid surface composites like Corian®, engineered stone like Silestone® and Swanstone, or laminates like Formica®. Countertop replacement – Refinishing can save you money! 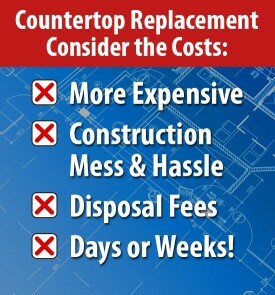 Countertop replacement is almost always more expensive than countertop or vanity refinishing. Refinishing can save you up to 50% compared to replacement and eliminates the mess associated with demolition and construction. In most cases, you can use your kitchen with 24 -72 hours, depending on the selected finish. Countertop replacement - Things to consider before replacing a countertop. Countertop replacement may be the best option when totally changing kitchen or bathroom floor plans; however, if your makeover plans do not include altering cabinetry, refinishing is an affordable and attractive alternative. Before choosing countertop replacement, compare the look, cost, and color selection as well as time and mess involved. Refinishing your existing countertop could be your best option. Countertop replacement – How to Select a Professional Refinisher. Click on Find a Location or call our toll free locator number, 1-888-271-7690,to find the nearest Miracle Method office and request a free estimate. When you have all the facts, then you will be able to make the best decision for your makeover project.